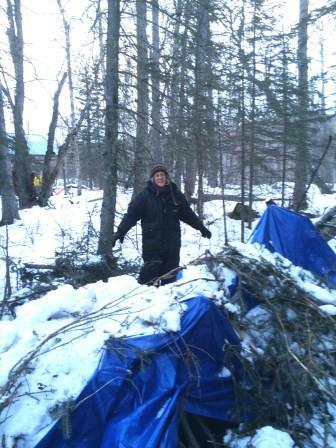 February 17, 2014: Survival School, Part II: What’s a Nice Girl Like Me Doing in a Place Like This? The second day of survival school started out a bit shaky. Before I was even vertical, the powers that be verified that I am not cut out to sleep under a log on a regular basis. My being in the twilight of my years made this realization easier to take. In just a few years, I’ll kick back and watch documentaries in which the truly competent haul themselves up and down dangerous peaks during the day, and sleep outside at night. And I’ll tell those watching the same that I once slept in and built my own shelter. I woke up at 6:30 a.m. Had to pee. Stacey Re indicated that she had to do the same. So she decided to get up. I followed suit after telling her that I’d had this dream in which I was taking a leak in a trout pond where there were bonsai sculptures. Stacey climbed up out of the belly of the beast first, because she was closest to the exit. I momentarily stayed scrunched up under the right side ribs. This left me with space to fumble. And fumble I did. I couldn’t find my glasses – Stacey said moments before I’d had them on my head. So I rooted around in my sleeping bag and in my scattered belongings, being careful not to kneel on the displaced object. I finally gave up looking, and got ready to greet a new day. Actually, it was still night as far as I was concerned – it was dark out. I put my fleece hoodie back on, and tried to get my mukluks on my feet. This was difficult because these items, which are made of moose hide, were frozen. I jammed them in place – and walked to the outhouse with them flopping on my feet like dead fish. together in some ways; otherwise, they wouldn’t be able to survive in winter environs. Upon my return, Stacey, dressed, had gotten a fire going – mind you, with no matches. She did this with embers. I stepped around the flames, climbed back into Stego, and with considerable effort, got my boots on first, then my Refrigerware suit. I had never before put the latter on in a space with limited headroom. But as I discovered, when one is determined, they can accomplish great things. And indeed, this was a great thing. Otherwise, I would have had to put the one piece suit on in the cold, and I most definitely wasn’t up for that. It was still dark out. I stuck my head in Stego, pulled my headlight out of my pack, and put it on my head. The strap had somehow become loose, so it repeatedly fell into my eyes. This reminded me that I still hadn’t found my glasses. Fingers were getting cold, so I groped around for my gloves, which two days before, Pete (upon my orders) had attached to a rope. I recoiled as I felt something odd in my left glove, then smiled as I recalled that this was where I’d put my glasses. I quickly put them on, and glanced over at Stacey. If she was at all aware of my poorly executed transition from horizontal to vertical, she made no note of it. I suspect she was very aware of it, but was too polite to say anything. Stacey was also too polite to say that I’d put her life in danger by (the evening before) failing to gather up the deadfall that surrounded our tent area. This could have sparked and started a fire, killing us all. “Live and learn,” I muttered, to which Stacey said “pardon?” “Oh, I was just thinking out loud about the fact that my dehydrated fruit is frozen, and that the next time, I’ll put it at the bottom of my sleeping bag with everything else I own,” I said. I spent the remaining part of the morning attempting to look as though I had my act together. I managed, for example, to squash most of my belongings back into my backpack. Then, before anyone noticed (most still weren’t up yet), I took that which did not fit in my pack back across the lake, to the car that held my gear. I did this because I rightly feared that otherwise, the others would see me having to make several trips, and consequently see me for what I was beginning to feel I was – a survivalist rube. A large part of group work involves keeping up appearances – and this is what I spent my remaining few hours at the Chickaloon subdivision attempting to do. By 9 a.m., everyone else (of course) appeared to have all their gear in order, packed, and ready to go. I didn’t see anyone besides Stacey eat or drink – this verified my contention that my fellow campers were all from another planet, that is one in which the aliens had internal food and water storage areas. We had a brief lesson on signaling for help and using a compass to do so. This was lost on me because I knew I’d have to actually do it in order to learn it. We then trekked through the now torn down subdivision and did a group sweep. All I could think was all that energy and hard work for naught. A home today, a wood pile tomorrow. Hardly seemed right to me. Done, we headed back across the lake to our waiting vehicles. I, who had put my water bottle and food bag on the picnic table, retrieved them before setting out, then hurried along, in hopes of catching up with the others. 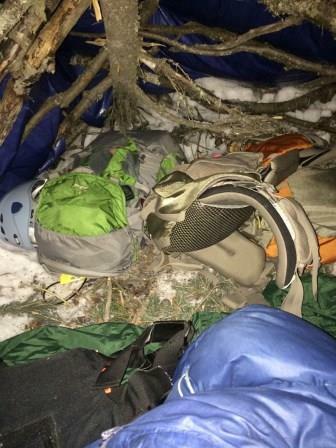 Ahead of me were a dozen individuals with trekking poles, balanced backpacks, and state of the art snowshoes. All seemed to float across the crunchy, rutty snowpack. And me? I pulled up the rear, glad of course of having the good fortune not to be in anyone’s line of sight, for what a sight I was. I carried my backpack on one shoulder, snowshoes in one hand, and bright orange avalanche shovel in the other. And rather than float, I staggered like a drunken little old lady. The prospect of my soon being in a warm vehicle cheered me considerably, in fact so much so that as I stumbled along, I was easily able to put a positive spin on my recent experiences. Yes, it was easy to be accepting of the fact that I was almost a card carrying member of the chronically inept. Almost, but not quite, for I’d actually had several shining moments while on this great adventure. First of all, I’d dressed for the weather (many layers on Day 1, Refrigerware suit on Day 2), and I consequently stayed fairly warm. When feeling chilled, I simply walked around and warmed up. Thus, I did not have to break into my toe warmers, and in fact I gave a handful of them to Stacey. In addition, I’d brought along good, nutritious food. This served me in good stead the entire two days. I’d also packed in such a way that I was easily able to get at my belongings. And lastly, my single greatest accomplishment was that I didn’t lose anything, this including my mind. I misplaced my new gloves a few times, but not so often or long as to inconvenience anyone. So yeah, I was, as I reached the parking lot, one happy camper.